With choosing from our Semi-Custom collection, our process allows for you to find an invitation you love that has been hand crafted with with a more convenient, less time-intensive, yet personalized design experience. Featuring Seeded Eucalyptus and watercolor brush calligraphy, The Anne Suite is certainly one that's near to our heart. This suite is the ideal blend of organic elements and hand-painted details. This suite is also available in Handmade Paper as well as classic Card Stock shown here. There's something romantic and wild, yet classy about The Sutton Suite. 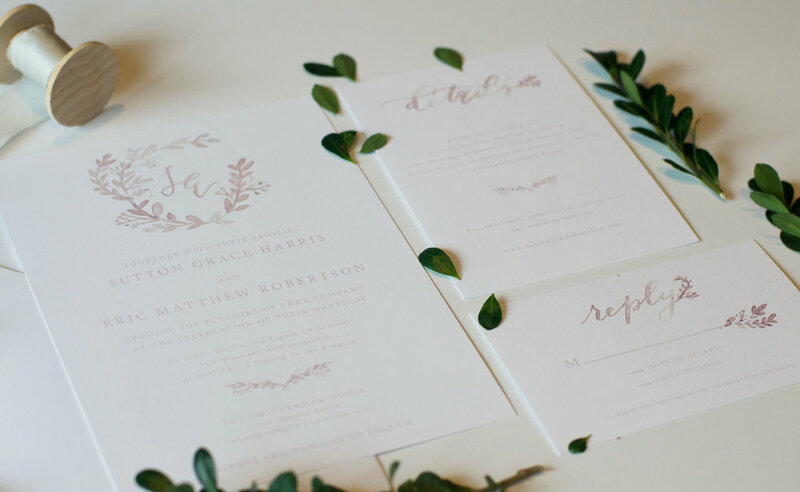 This suite features a hand-painted watercolor greenery wreath and unique and delicate greenery details in a subtle blush. As you can see here, the type of paper used can make a big difference in the overall feel of the invitation suite, featured here on both Handmade Paper with lacy, deckled edges as well as our classic Card Stock. The Gabriella Suite has an antique vibe, with some seriously amazing personalized touches with a custom venue sketch (featuring The Carolina Inn here) as well as a modern calligraphy monogram with a laurel wreath. Though it's featured here on handmade paper, we also offer this suite in straight-edged Card Stock. The Maya Suite surrounds your hand-calligraphed names with draping Italian Ruscus vines, available in a wide array of colors complimented with more greenery touches on the coordinating response + information cards for a detailed and organic feel to your invites. Also available in our Card Stock but shown here in the gorgeously organic Handmade Paper. If you're looking to mix a bit of classic crest details with some unique watercolor details sprinkled in and featuring modern calligraphy, The Mackenzie Suite might be the perfect fit for you. This suite can be printed on Card Stock as shown here or on our 100% Cotton Rag Handmade Paper. 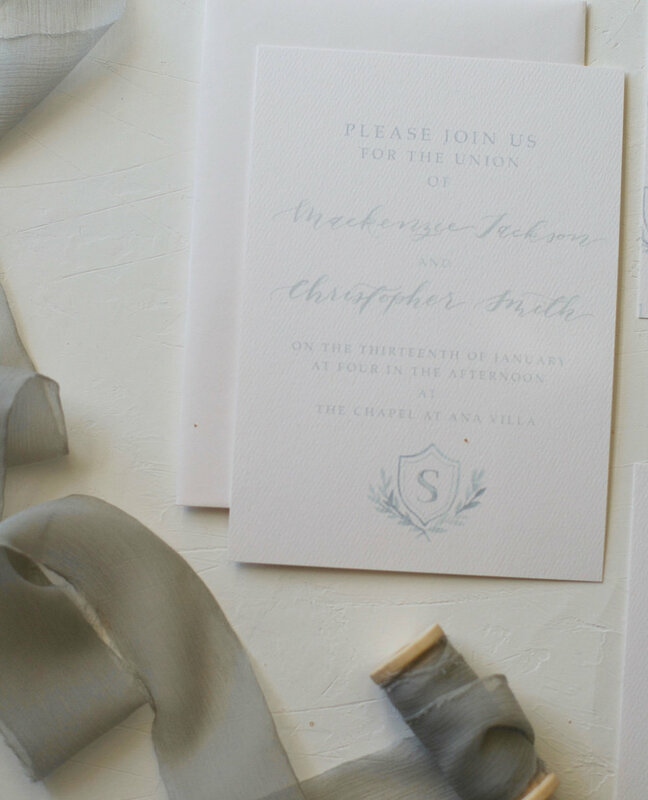 The Heather Suite is for the detail and handmade loving bride, down to the watercolor wash details, modern calligraphy + wax seal adorned invitation card. Upgrade this a bit more by asking about adding a custom designed wax seal stamp! Wanna know the best part? You can schedule a commitment-free call with us to discuss our Semi-Custom Invitation Collection or Custom Invitations!